The Hong Kong-Cambodia relationship can be further strengthened through trade, investment, business ventures and cultural and people-to-people exchange, and there is a lot that Cambodia can tap into with Hong Kong as its partner in exploring new business opportunities in the Mainland of China, the region and the wider world, the Secretary for Commerce and Economic Development, Mr Edward Yau, said at a business luncheon seminar entitled "Hong Kong: Your Partner in Exploring New Business Opportunities" in Phnom Penh, Cambodia today (March 20). Mr Yau is leading a 48-strong delegation of investors and professional service providers from a wide spectrum of Hong Kong’s top businesses, including commerce and industry, accounting and finance, legal and dispute resolution services, startups and others to visit Cambodia and Vietnam to expand and strengthen business networks with the two countries. The seminar was co-organised by the Hong Kong Special Administrative Region Government and the Hong Kong Trade Development Council with the Hong Kong Business Association of Cambodia. "First and foremost, Hong Kong offers the most accessible, safe and secure gateway into the Mainland of China. There is one single and simple advantage - the 'one country, two systems' principle that Hong Kong is operating under. 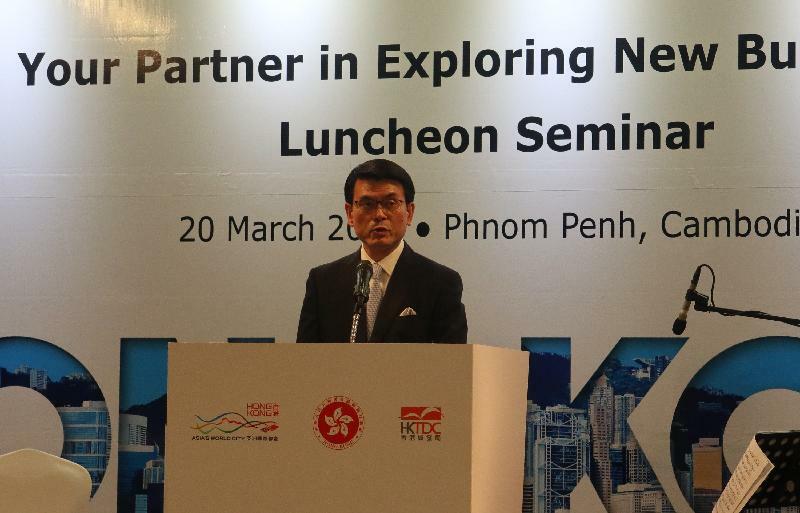 Through our free trade agreement with China, companies in Hong Kong, including Cambodian ones if they are established in our city, enjoy greater market access and easier inroads into the world’s biggest and fastest-growing market," Mr Yau said to some 300 participants at the seminar, which included key representatives of the local business sector. "But the added and unparalleled advantage of Hong Kong is in the different and more open and business-friendly systems that we operate. This includes a legal system premised on the common law system; an internationally convertible currency; free flow of capital, information and people; and business and professional services that follow international standards and practices," he added. 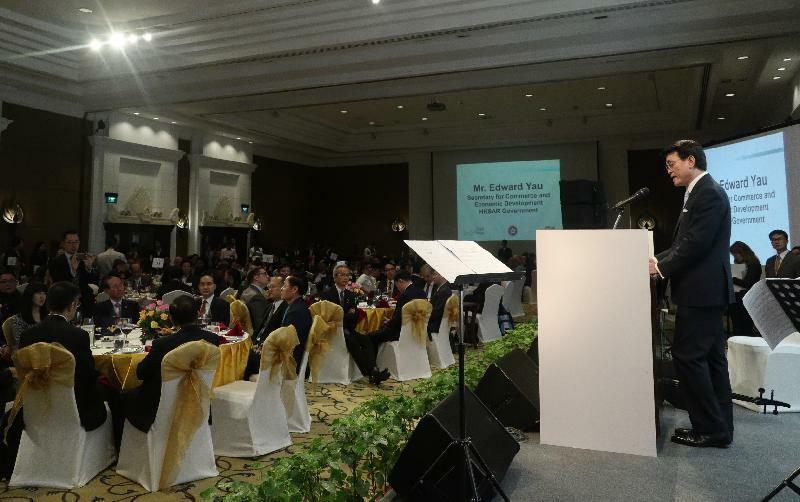 On the professional services that Hong Kong can offer, Mr Yau said that they are abundant and deep. "Commonly sought-after services include legal, accounting, insurance, business consultancy, risk assessment and management, arbitration and dispute resolution, project financing and funding, bond issuing, construction, architecture and transport, just to name a few. These are highly specialised and sophisticated professional sectors that are operating in Hong Kong but serving the Asian markets." He said that the Central Authorities fully recognise the distinctive advantage of Hong Kong under the Belt and Road Initiative. "If the Belt and Road Initiative is something that could help drive better economic opportunities between Cambodia and China, Hong Kong is the gateway, the springboard and the crucial link you can tap into." Hong Kong was Cambodia's eighth largest trading partner, 13th largest export market and seventh largest source of imports in 2016. In 2017, 13 per cent of the total trade between Cambodia and the Mainland was routed through Hong Kong. Before the seminar, Mr Yau called on the Minister for Public Works and Transport of Cambodia, Mr Sun Chanthol. 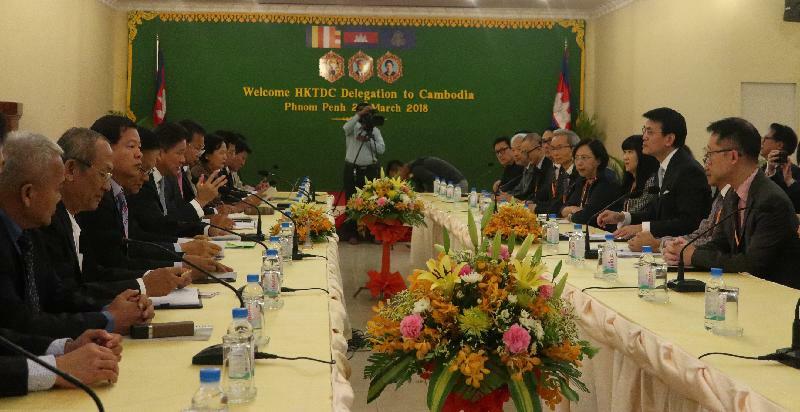 He received an update on the latest infrastructural developments of Cambodia and exchanged views with the minister on potential collaboration opportunities under the Belt and Road Initiative. Meanwhile, some delegation members who are on a specific excursion to find new locations for expanding or relocating their manufacturing lines visited the Phnom Penh Special Economic Zone and factories there. The delegation will proceed to Ho Chi Minh City, Vietnam this afternoon for the second leg of their visit.